It's always an interesting read when you check out a Bahamian newspaper. 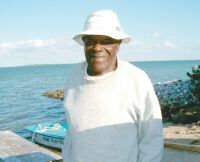 So in the spirit of Easter, I came across this article saying that legendary bonefish guide Bonefish Foley of Grand Bahamas got confirmed by the Anglican church at age 91. Foley, who's name is Israel Rolle, is a legend among Bahamian flats guides and used to fish Grand Bahamas. I almost fished with his son, Tommy, a few years ago but it didn't work out. You can spot a good bonefish guide in the Bahamas when they adopt "bonefish" as their moniker.